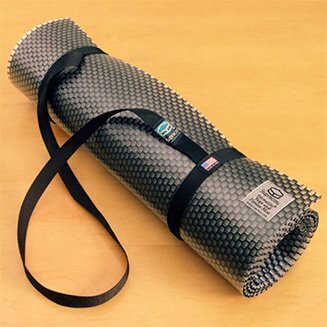 You'll never need to double up or use an extra mat to cushion your bones with our Stimulite Yoga Mat. The honeycomb cells grip the floor while the encapsulated air pockets uniformly support weight and prevent slippage. The cells' flexing action provides exceptional stability enabling you to comfortably sustain postures while stimulating blood flow to fingers and toes. Unlike conventional "sticky" mats, the Stimulite Yoga Mat's hygienic, non-porous surface is naturally antifungal and antibacterial. Just wipe with water. Comes with a convenient tote strap that can be used for stretching. Great for Pilates, too! If you have any questions about this product by Supracor, contact us by completing and submitting the form below. If you are looking for a specif part number, please include it with your message.